I will be on joining Catholic Answers Live Friday at 6 PM Eastern time — from the airport . . .
. . . because Janet and I have to board the plane for Israel at 7 PM. Appropriately, the topic of our show is "Pilgrimages and Why Catholics Should Take Them." We intend to discuss pilgrimages in the Old and New Testaments, early Christian pilgrimages, and ask the questions: Are the sites authentic? What is Holy Ground? Why not just read the Bible from home? We'll also answer many practical questions such as: Is it safe? Who can go? and many more. 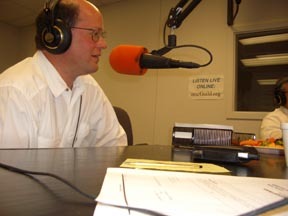 Even if you don't get Catholic Radio you can log on here Catholic Answers Live and listen over your computer. You can also go here to get the show later on iPOD, MP# or streaming audio. 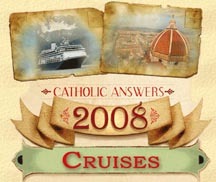 We will also be discussing our upcoming Catholic Answers Mediterranean Cruise in October. Janet and I are invited as speakers and guides. We are very excited about this cruise that will take us to Israel, Egypt, Ephesus, Athens and Corinth, Rome and more. To leave more about that cruise, click here. 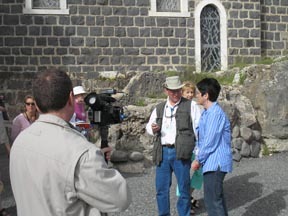 In Israel, starting on April 2, Steve will be broadcasting live on-location from Galilee and Jerusalem each day on Catholic Connections with Teresa Tomeo from 8-10 AM Eastern on Ave Maria Radio, Sirius Satellite Radio, and EWTN Radio. You will also be able to join us on a Virtual Pilgrimage each day (with Teresa and Immaculee Ilagabiza, author of "Left to Tell") on Steve's blog .